Home | Vinyl Siding Colors | Vinyl siding colors: can metal siding compete? Recent problems with a particular brand of aluminum and steel siding highlight the differences in color consistency and manufacturing processes when you compare metal wall cladding and vinyl wall cladding. The Construction Defect Center, an advocacy group based in Washington, D.C., is urging U.S. homeowners who purchased Gentek steel or aluminum cladding products to call and voice their specific complaints related to Gentek. The CDC says that inconsistencies with color, as well as problems related to cracking, peeling and chipping with the paint are at the heart of issues with the company's steel and aluminum cladding. Other homeowners have voiced concerns related to service of warranties that go along with the purchase of new siding. "In some instances this product was sold with the promise it would last decades, and many homeowners appear to be having problems in just a few years after installation," the Construction Defect Center reports. Besides the obvious differences in material characteristics between metal, aluminum and vinyl cladding, color is introduced to these products using very dissimilar processes. With metal and steel cladding, the color is added after the materials are formed. Once the siding is pressed, an acrylic-based paint is applied and baked onto the material. Manufacturers of steel and aluminum cladding warranty their products against peeling, chipping or blistering of the paint, as well as color fading over time from the sun aging the product. For the most part aluminum and steel cladding is as reliable as other types of siding, but in the case of Gentek, the company faces a class action lawsuit filed by homeowners in 2011. Homeowners who choose new vinyl siding to clad their walls should not face the same problems, primarily due to the manufacturing process for vinyl products. Vinyl cladding is composed of two layers of polyvinyl chloride (PVC) resins and various other additives, like titanium dioxide for UV protection. Colorants are added during the manufacturing process and are bound within the material providing consistent color throughout. Vinyl products are typically well-suited to withstand impact damage and resist scratches or nicks and dings because the color permeates the siding material. Color is just one example of how vinyl siding benefits homeowners by providing an improved solution in comparison to metal building products. 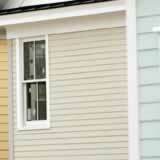 Vinyl siding colors can last the lifetime of the material.